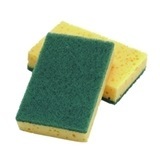 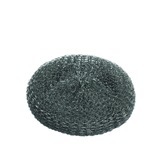 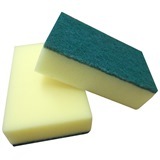 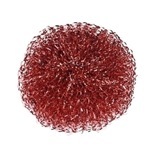 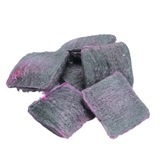 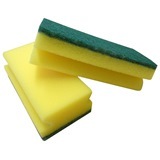 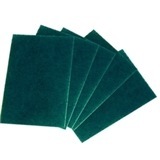 Coming in a few incarnations, the scourer is essential for kitchen staff who need to clean and maintain surfaces. 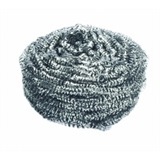 The typical rounded scourer is made from stainless steel, wound into shape to allow an abrasive action against tough engrained marks and baked on food, however general surface cleaning with scourers should only be on stainless steel, or other non-porous hard surfaces. 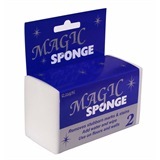 For walls and floors, a magic sponge may be more suitable in order to preserve them; a solid sponge used with water alone, this multipurpose marvel will easily remove marks and stains across a variety of different surfaces - even car bumpers and trainers!